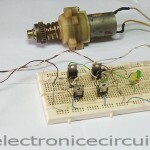 This circuit can control direction of a DC motor. In many applications we need to operate the motor in both directions Clockwise and Anticlockwise (forward and back). 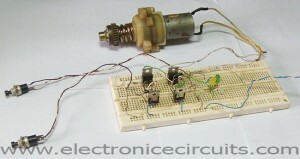 One way of achieving this is to connect the motor into a Transistor H-bridge circuit arrangement. H bridge is an electronic circuit that enables a voltage to be applied across a load in either direction. These circuits are often used in robotics and other applications to allow DC motors to run forwards and backwards (Bi-directional). In this circuit normally PB1 and PB2 are open. So the bases of the transistors are grounded. Hence Q3 andQ4 are ON, Q1 and Q2 are OFF. The voltages at both the motor terminals is the same and hence the motor is OFF. Similarly when both PB1 and PB2 are “PUSH” the motor is OFF. When PB1 is PUSH, Q1 becomes ON since it is NPN. This type transistor needs high potential at the base to turn ON. But the Q3 is OFF. Because it is PNP and it needs to low voltage to turn on. PB2 is still OPEN so transistor Q2 OFF and Q4 ON because low potential appear at the base of the transistors. So current flow through Q1, M1 to Q4. So motor rotates one direction. When PB2 is ON and PB1 OFF similarly Q2 and Q3 are ON and Q1 and Q4 are OFF. Now current flows through Q3, M1 and Q2. Now motor rotates another direction. The diodes protect the transistors. They allow back E.M.F. to bypass the transistor. The LEDs indicate the direction of the motor rotation. 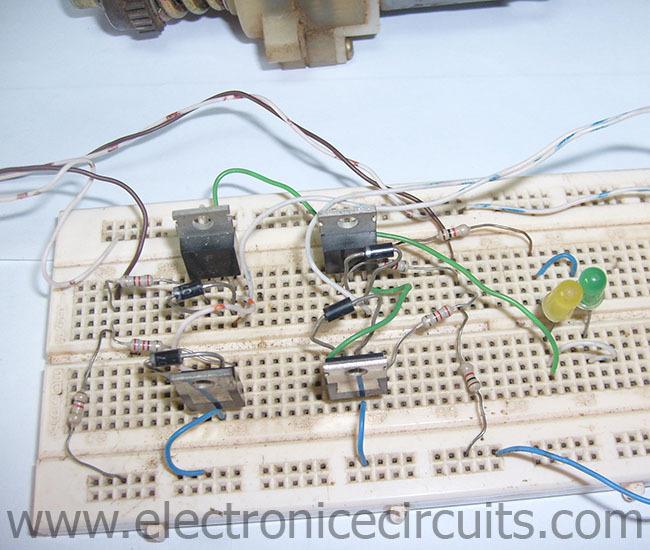 The transistors are EMITTER FOLLOWERS and the voltage on the motor will be less than the voltages of the circuit above because the output voltage will be determined by the slight drop across the 1KΩ+220Ω and the voltage drop across the base-emitter junction of the transistor. The total voltage drop to the motor (due to both sides of the bridge) will be about 2v. When the both inputs high or low this emitter follower H-bridge circuit has not any current flow. It is the advantage of this circuit. Sorry, but what is the maximum current supports for DC motor? How would this work for a 18v or 24v dc motor? i use tip42 and tip41 for replace of 2sd313 and 2sb507. but my circuit have problem the both tip42 is too much hot when motor is working condition on forward and reverse. Very good schema but its rotating direction is through manual switches.Motor is on in either direction as long as either of the switch is on.Can you describe a circuit where motor is constantly running but will change direction only one of the two switches is momentarily pressed? Actually you could use a spdt relay to accomplish this without using the switches at all replace them with jumpers. Put the relay in the positive line between where the switches go now. Feed the power to the relay and not the board. Then hook one switch up to the relay and when you push it, it will switch the power feed to the other side of the circuit. It’s amazing what you can learn on the internrt, even a 68 years old. I never knew that there was such a then as a spdt (single pole, double throw, spring loaded)switch. But, you can find them on Ebay or Amazon or any electrical supply house. 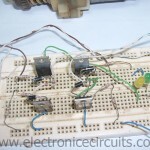 Then you could put at into the circuit without using a relay. All you would have to do is feed power to the center post of the switch and feed the end posts to each side of the circuit. I am currently working on building the same circuit, my problem is how can i measure the speed of the motor? Can this circuit operate on a 24vdc and carry aload of 200w ? I found this circuit a couple weeks ago. It is the simplest that I have found in all of my searching on the web. I will be using it to control a new type of motor that I have been working on for quite a while. I replaced the 2 switches with LDRs and it works perfectly. I didn’t have to use resistors with the LDRs either. 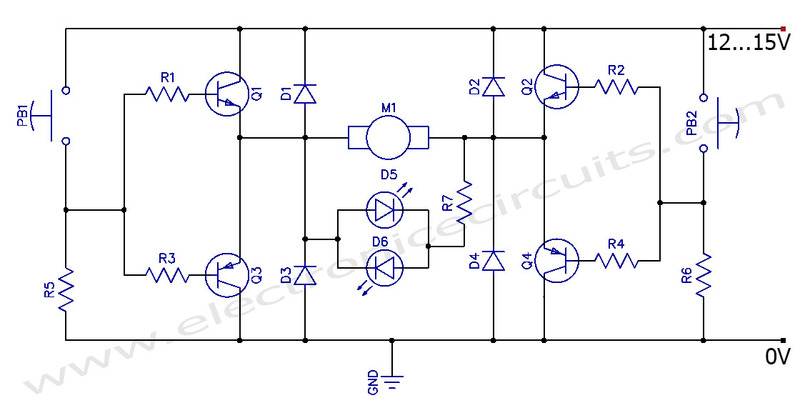 Thank you very much for posting this circuit. i want to rotate an AC single phase motor clockwise and anticlockwise so can i use this circuit for this purpose? How can I alter this circuit to control speed along with direction of the motor?